Is Bark Mulch Around Vegetable Plants Safe? Mulch comes in two basic types, organic and inorganic. What type you desire to use is mainly a personal preference. Both types will work, but both types also have their drawbacks and advantages. Knowing your garden's needs will help you decide which one is best. Stone mulch is inorganic. It consists of pea gravel and assorted sizes of stones. Organic mulch consists of pine bark, cedar chips and pine straw. Stone mulch will not deteriorate over time. The stones might sink into the soil, but they will not break down. Organic mulch will break down over time and mix with the existing soil. It will add nutrients to the existing soil whereas rocks will not. 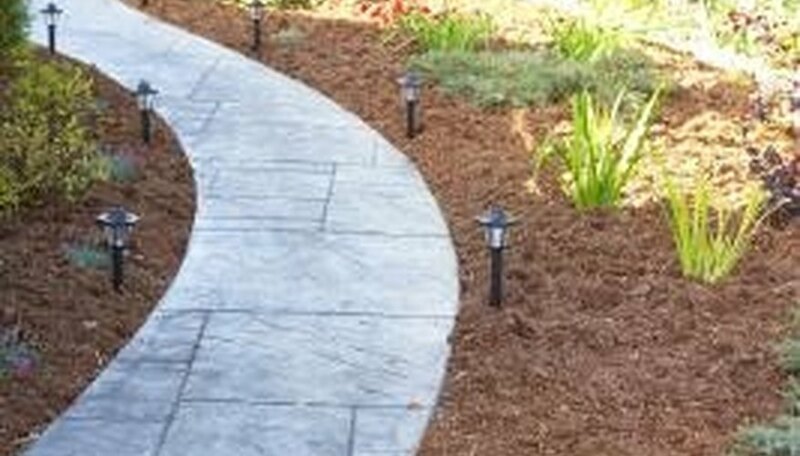 Stone mulch has a long life and will need replacing less frequently. It is a good choice for walkways or drought-tolerant gardens. Organic mulch retains moisture and heat in the soil and is easier and lightweight to install. Stone mulch is harder to weed, if herbicides are not used. It will also retain heat and remove moisture from the planting area. Organic mulches have a shorter life and will need replacing annually. They can attract bugs. 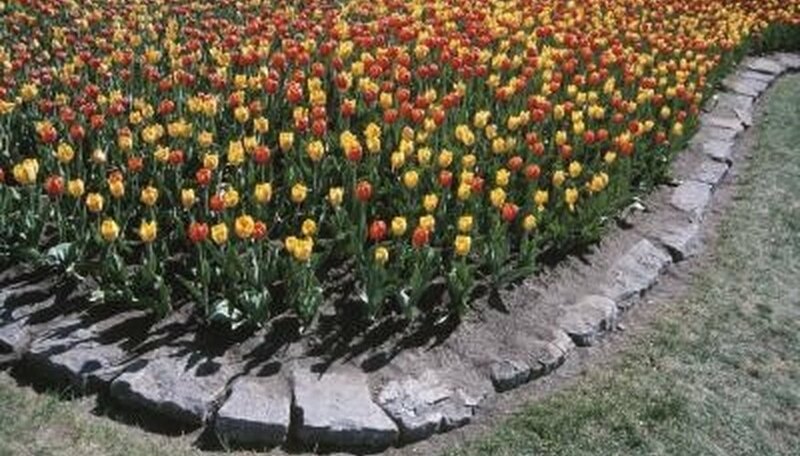 Consider placing rock mulch in areas where plants do not require much moisture, but desire heat and dryness. Consider using organic mulch in areas that require moisture and heat. Measure the area of your lawn where you've planted the grass seed, noting both the length and the width. Multiply the length and width. The total is the area of your lawn in square feet. Calculate the amount of mulch you will need by multiplying the area of your lawn by .0031, and then multiplying that by .25. The total is the number of cubic yards of mulch you will need in order to cover your lawn in one-quarter inch of mulch. Set the fertilizer spreader to wide open. Spread the mulch evenly over the grass seed, making two passes on each area so that the mulch is about one-quarter inch thick over the grass seed. Water immediately to keep the mulch in place. Identify which areas of your yard are overrun with weeds and pull them out by the roots. Weeds take nutrients from plants and trees. Block further weeds by spreading a thin layer of dry grass clippings over plant beds and around trees. Use your hands to fluff the clippings weekly so they don't block moisture from reaching plant roots. Use stone, brick, or timber edging around gardens to block weeds and encroaching grass. Provide a clear division between the lawn and plants. Plant companion plants to repel pests and improve growing conditions. For example, garlic improves the yield and flavor of beets, while beets add minerals to the soil that aids lettuce and onions. Geraniums protect roses, tomatoes, corn, peppers and cabbage by deterring Japanese beetles and cabbage worms. Sweet marjoram is one of several companion plants that improve the taste of herbs and vegetables. Peas add nitrogen to the soil and improve the yield for many vegetables including turnips, sweet peppers and spinach, according to the website Golden Harvest Organics. Plant ground cover clippings or seedlings in terraces and other hard-to-reach areas to reduce maintenance and add greenery. Once root systems develop, thick patches of ground cover will prevent erosion and lock in moisture. Verbena has purple hues and is an example of a fast-growing ground cover, while creeping juniper stays green year-round. Clear the soil around your tomato plants. Only mulch tomatoes once they're well-established. 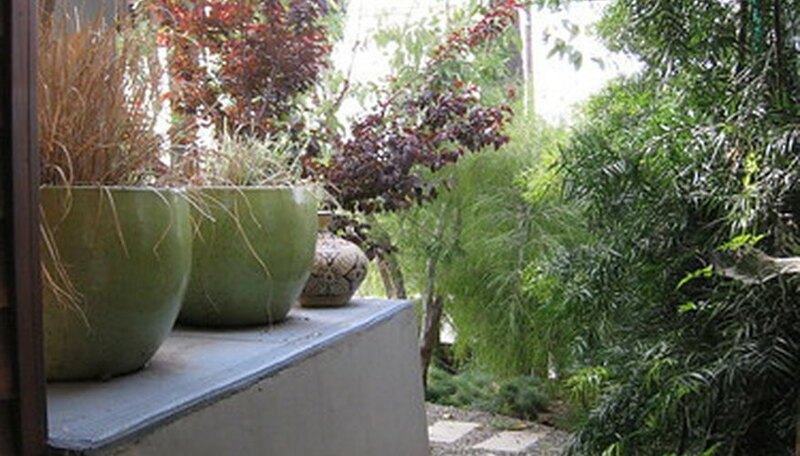 In a separate location, mix grass clippings, dead leaves and other plant material together. The more organic material you spread around your tomatoes, the more nutrition they'll get. Spread your grass clippings and mulch around your tomato plants. Leave a circle 1 or 2 inches in diameter around the base of your plant. Water well, both around the base of the tomato plants and over the mulch. The mulch will soak up and maintain the moisture for the tomato plants. 1. First, find out the size of the area you want to cover in square feet. This is easy; just multiply the length of your garden by the width. 2. Next, decide how deep you want your mulch to be, in inches. A couple of inches is usually sufficient. 3. Now multiply the size of your garden in square feet (#1) by the depth of your mulch in inches (#2). 4. Divide the number you get in #3 by 324. This is the number of cubic yards of mulch you will need to cover your garden. If you're looking for a way to save lots of time in the garden, look no further. Mulching your flower and vegetable beds will drastically reduce the amount of time spent weeding, watering and fighting pests. Mulch also improves the appearance of your garden, and keep dirt from splashing up on your flowers and vegetables when it rains. If possible, consider using an organic mulch. Organic mulches are those that used to be living material, such as bark, straw, leaves, grass clippings and pine needles. These organic mulches improve the soil by adding nutrients as they decompose and encouraging earthworm activity. Organic mulches aren't perfect, though. If you have problems with rodents, you may want to choose an inorganic mulch. In very moist climates, organic mulches may hold too much moisture. The excessive moisture will encourage slugs and snails, and may even cause the stems of your plants that come in contact with the mulch to rot. Use the menu below to explore the advantages and disadvantages of some common (and a few not-so-common) mulch materials. Select a mulch type from the following list. Please use your browser's "back" button to return to this page. Stinkhorn fungi vary in color and size. The University of California Statewide Integrated Pest Management Program describes them as resembling a giant finger. Several varieties include the Clathrus columnatus or stinky squid stinkhorn, the Mutinus caninus or dog stinkhorn, and the Dictyophora duplicata or veiled stinkhorn. The upper end of the stinkhorn fungus is covered in a foul-smelling, slimy material that attracts spore-spreading insects. In nature, stinkhorn fungi decompose organic matter in the soil and convert the nutrients into a form that plants can use, so they often grow on organic materials like mulch. Aside from attracting flies, stinkhorn fungi do not harm plants or lawns. The Ohio State University Extension recommends purchasing mulch products that have low amounts of wood, choosing coarse wood products over finely-ground material and keeping the mulch depth to 2 inches or less. Soaking mulch after application also helps control fungal growth. Spread a layer of landscape fabric over the entire soil area before laying down the mulch. Secure the corners and edges of the landscape fabric with special pins and then spread the mulch over the fabric in a 2 to 4-inch layer. The landscape fabric will act as a barrier between the soil and the mulch, preventing weed growth. Unfold newspapers flat and stack them between six and eight layers thick. Spread these layers of newspapers over the soil before applying the mulch. Overlap the newspapers by about 2 inches to ensure complete coverage. Apply the mulch over the newspapers, applying between 2 and 4 inches of mulch evenly over the growing area. Cultivate the soil with the garden fork and rake it smooth. Apply the preemergence herbicide over the soil in an even layer and then water the soil evenly to activate the herbicide. Apply the mulch over the herbicide in a 2 to 4-inch layer. The herbicide will effectively prevent weeds from germinating beneath the mulch. Bark mulch decomposes slowly and depletes the soil of nitrogen. Other organic mulches are better for growing vegetable plants. Gardeners use mulch at the base of vegetable plants to retain soil moisture, control weeds, provide additional nutrients and maintain a consistent soil temperature. Grass clippings, pine straw, corncobs and nut hulls are better for vegetable gardening, due to the fast decomposition rate, than is bark mulch. Gardeners remove old mulch before applying a new layer to vegetable gardens, thus reducing nitrogen depletion from the soil. Apply 1 to 2 inches of mulch at the base of vegetables at the beginning of the growing season. Dried seaweed provides nitrogen, potassium and trace minerals needed for the large crop yields desired when vegetable gardening. Add dried seaweed to corncobs, porous organic compost, nut hulls or bark mulch for enhanced growth. Dried seaweed becomes slick in texture when added to grass clipping or pine straw mulch. Remove all but 2 inches of mulch. In general, it is best not to have more than 2 inches of mulch in order to keep mold and other fungi from forming. Turn over the mulch and chop it with a spade to speed up the process in which the mulch turns into soil. Soak the mulch with water to encourage other bacteria that compete with mold to grow. Move the wet mulch into a pile, and let the sun heat it up. The mulch should reach temperatures between 110 to 140 degrees F.
Return the mulch to its original location in the fall. When the mulch suddenly drops in temperature after being moved, the mold should die. 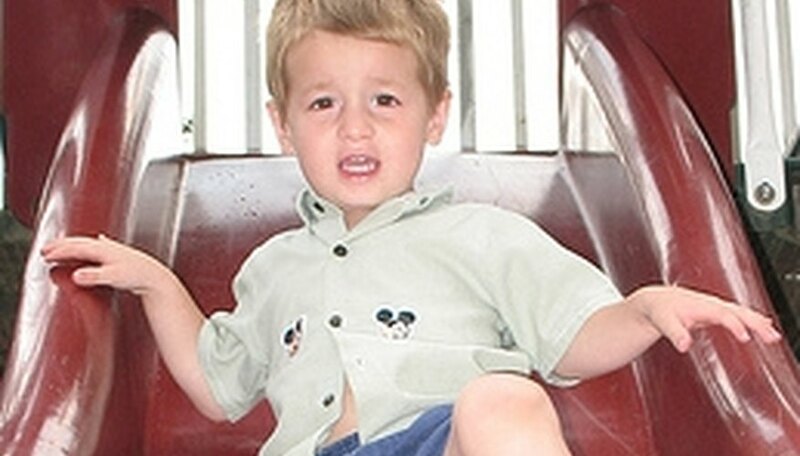 Playgrounds with a surface of concrete or asphalt are poor protection when a child falls, and often have a consequence of injury or even death. Surfaces composed of turf or grass work, but as time goes on they lose their ability to absorb a fall effectively. Mulch is one choice that is popular for placing underneath playground equipment that can cushion a fall effectively if enough is laid down. The material is first laid out at a depth of twelve inches, which will eventually settle and compact. When this occurs, it will be at the suggested minimum level of nine inches, which is the standard for all equipment over four feet in height. Equipment that is less that four feet in height can have the fill installed at a level of six inches. Back-and-forth swings and tire swings require the fill to extend further out than other equipment. 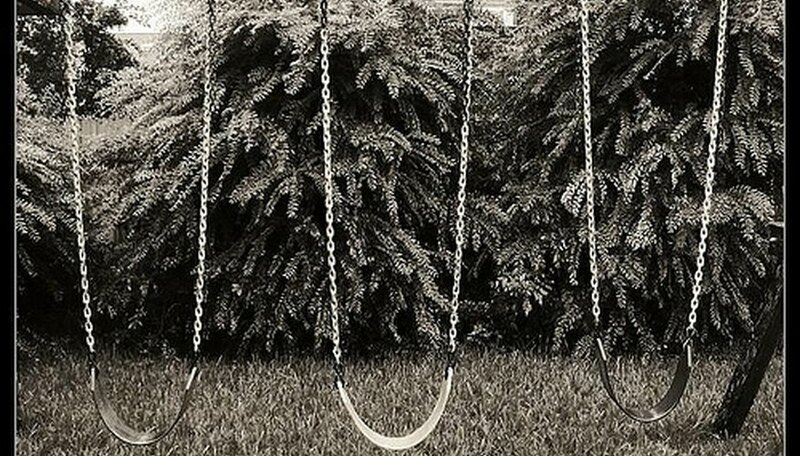 This prevents falls from hurting children when they jump off of the swing while in motion. The fill is monitored as it gets spread out, kicked out of the area and continues to compact down. Playground equipment that has the correct level marked on it helps homeowners to track the height and refill it if necessary. Do I Have to Spread Straw Over Newly Planted Grass Seed?